OK, folks. Sorry that I’ve been MIA for the last few days. This is a telling card for many of us. Considering the many hateful acts that have occurred in the U.S. this week, we really need to think about the direction of our society and how we change the idea that some have that their way is the only way. Look at the whole spread too. Being enlightened enough to understand that there are many ways to be a good human is not enough – we need to be active in our lives and our communities to make change. 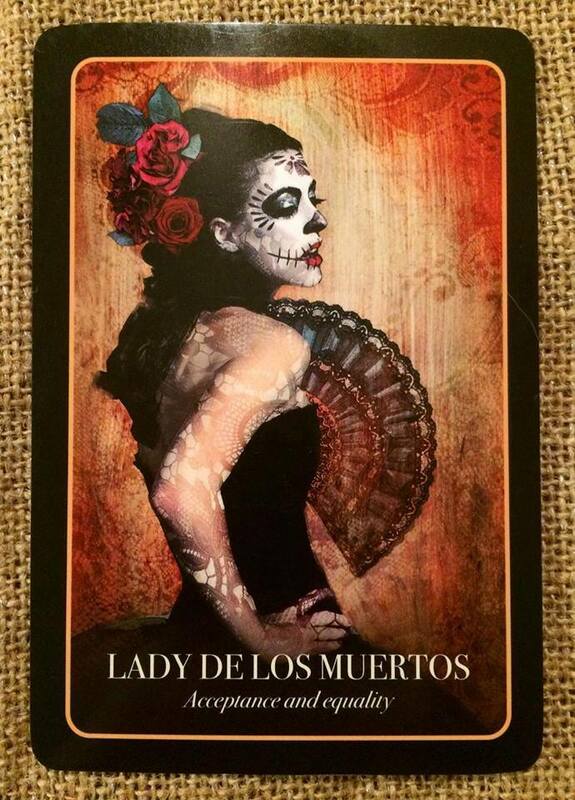 Look to the Lady de los Muertos as a guide. WE are all born the same way and we will all die regardless of the riches we do or do not attain, the religious path we choose and so on. Blessings! Full flowers upon your crown. The iconic lady of death, with a pale skull-like face, zombie eyes and rich red funeral flowers in her hair has become one of the most recognizable symbols of Halloween and the Mexican Day of the Deal, El Dia de los Muertos. The original model for this flamboyant lady of death can be traced back to the ancient Aztec goddess Mictecacihuatl. As time went on, the figure remained balanced between beauty and horror, and morphed into the Lady of the Dead and eventually into the more modern graphic figure of “Catrina.” It is also reported that the identity of the original “Catrina” was bawsed on women who were very rich and had everything they wanted in this life. Yet, death takes everyone, equally, so it was a reminder that no matter how beautiful, rich, popular, or famous you were – in the end, death takes all. The Mexican culture has a long-standing history of “laughing at death” and seeing it as just another aspect of life. In some ways, death is the last taboo in many Western cultures. We tend to hide away our dying and some of us may never even see the body of someone who has passed in our whole lives, but this was a much more common occurrence in the past. Acknowledging that death is a natural process that will enter everyone’s life at some time and that perhaps, until then, choosing to be life affirming takes away much of the fear. Take a light approach to a situation initially and it may work out better. If you are holding on to something that does not serve you any longer – in particular materials things – simplify and let go. Ahhh, fear. I have no fear of scary movies or a walk at night, but sometimes fear can affect us in more subconscious ways. Fear of change. Fear of failure. Fear taking a leap and falling on your rump a few times. We need to remember that failure and change are key elements of growth and learning – not something to be feared constantly. And they are ready for the chase! Today’s modern graveyards are restful places – normally highly manicured and very well set out. While they can be places of profound sadness, few are the creepy gothic places of old, yet they still hold an undercurrent of fear and seem frightening places. Due to countless stories of haunted graveyards, the thought of walking through cemeteries evokes fear in many of us – we imagine zombies and ghosts rising from the graves and bad spirits hiding out, waiting to harm an unsuspecting living person walking by. The idea of being at a graveyard after dark, or worse, at midnight, is the stuff of dares and nightmares. But this isn’t the way with every culture. On the Mexican Day of the Dead, whole families picnic on the graves of their loved ones who have passed. 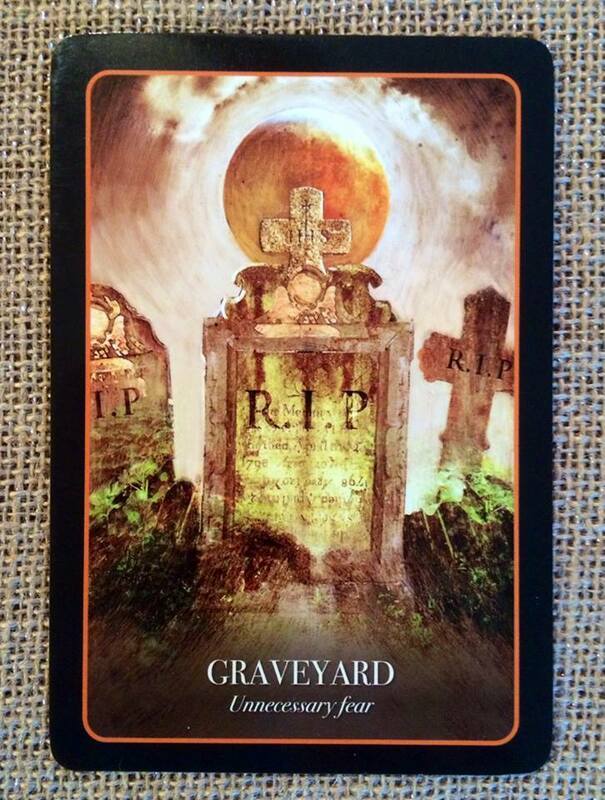 Children play upon the graves, people play music, drink wine and share food all in the “company of the dead.” Graveyard dust is used as an ingredient in protective spells, not in curses. Pull this card and know that you fear unnecessarily. Things are not as they seem and you can overcome your obstacles. The anxieties you have, although real, should be put aside before they haunt you long term. Instead, trust that you know the correct next steps and that you will act upon them. Today’s card speaks to me both for everyday and spiritual life. I need more diversification in my work but have always had it in my spiritual endeavors (which has been fruitful). Being open to new paths and ideas, though initially uncomfortable, has often provided me with a richer experience. Just keep your antenna up for anything that could be amiss, but even things that don’t work out will give you a learning experience. A typical depiction of a witch sees her standing over a boiling cauldron slowly stirring the bubbling and mysterious contents. As she stirs the enormous metal over the raw flames, she cackles and incants commands to all the elements, transforming the contents into something magical. Cauldrons were commonly used in ancient and medieval times for everything from the nightly meal to the making of medicines. This “family crucible” was usually placed within the hearth of the home, making it an essential part of the gathering of family. Much healing and nourishment came from the cauldron. 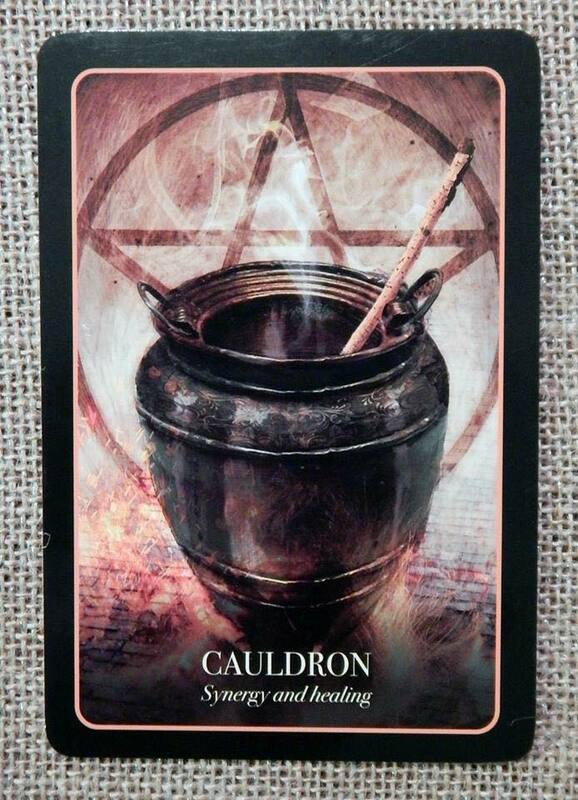 Should you receive the Cauldron card, it indicates the importance of combining a variety of techniques or elements to get the best result. Do not pull all your eggs in one basket. Refuse to choose just a single rigid pathway when a variety of ways are there to be enjoyed and experienced. You can find your own ways to create something new. The cauldron is a deeply transformational tool – things change once they are put under pressure. Resilience is being cultivated over time and this means that you will be able to withstand any negative pressure much more healthily from the inside out. 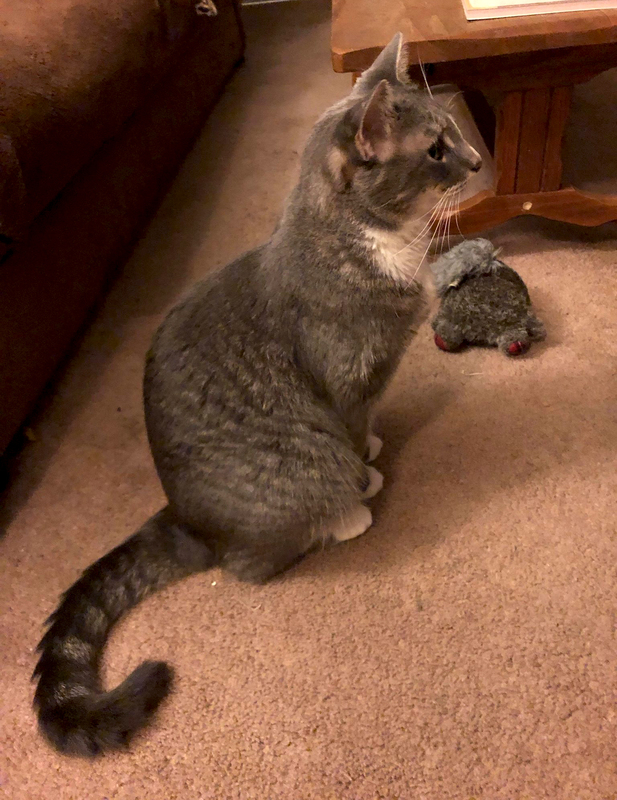 So, first up in news in the PTM household: We may have a new family member! 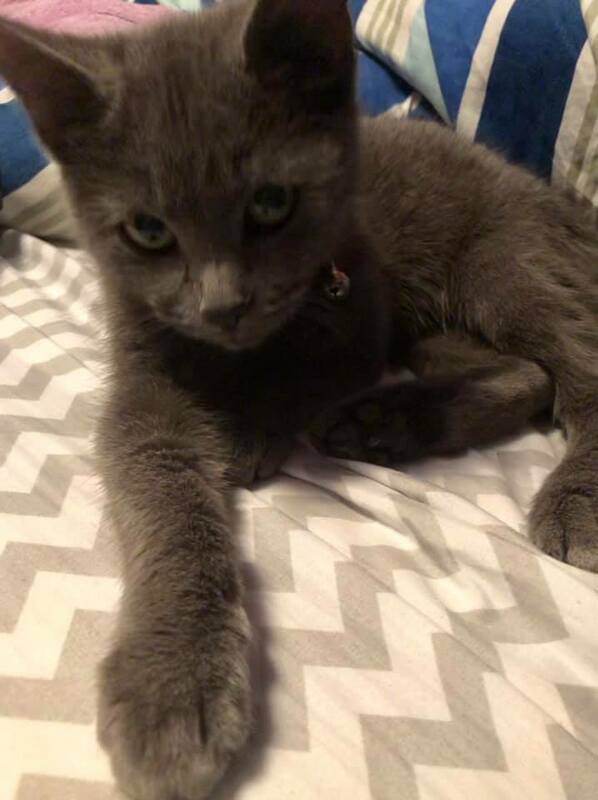 I posted about this cutie a couple days ago, but no one has claimed her yet. 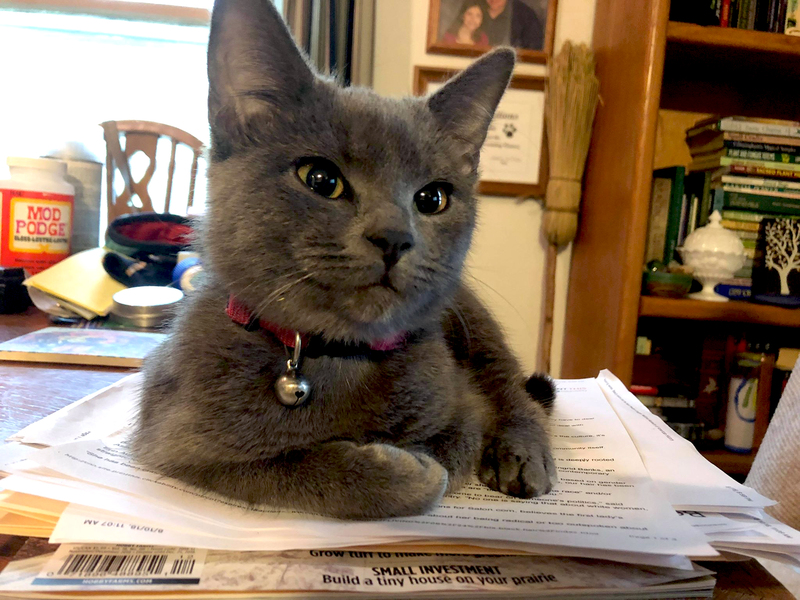 We were planning to find her a good home, but of course, we’ve gotten attached to her already (we *think* it’s a girl). She’s sweet but can have an attitude, and she has this uncanny knack for making everyone feel like she’s their kitty. Anyway, we’re calling her Cerridwen for now. Tarot Kitties Newt (below) and Budge are NOT happy at the moment, but we are sure that will change with a little time. 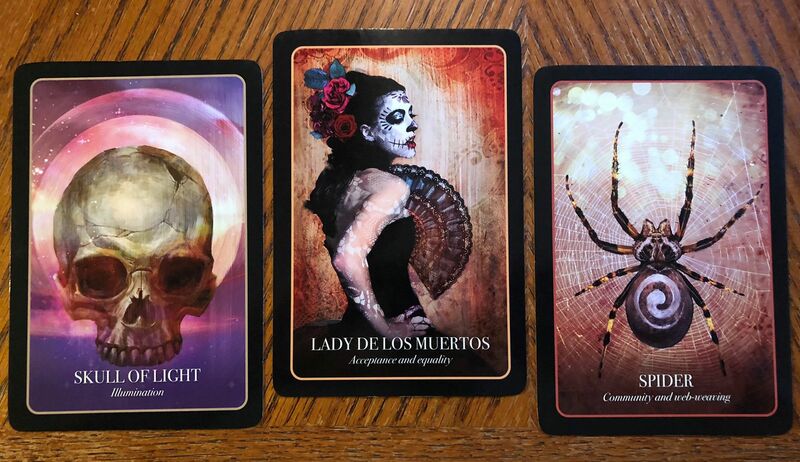 We are back with a card today, and it looks like we might need to pull out a mirror, crystal balls, or a cup of water and see what you can see. Or perhaps find another way to develop your intuition. Whatever you do, have a great day! 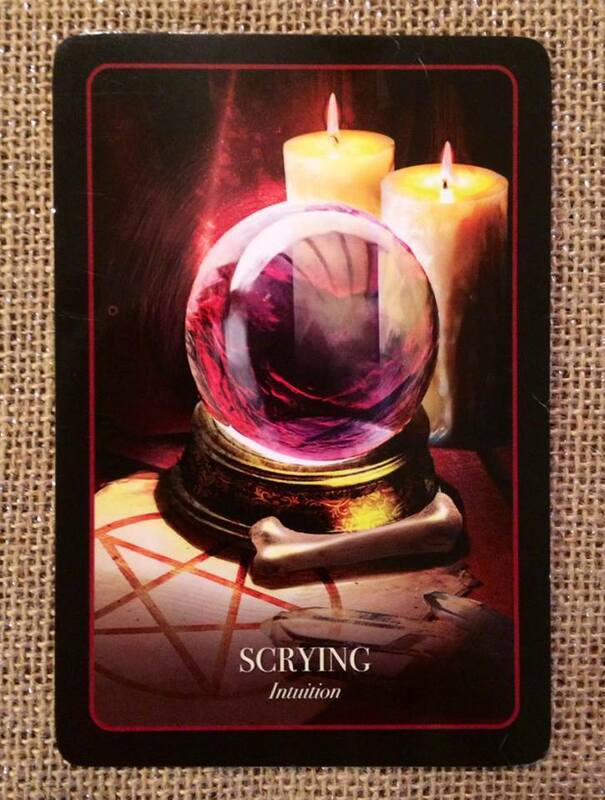 Scrying is the divination technique of seeing unconscious images (or images from the divine or supernatural) appear upon or within a surface. People scry into a crystal ball, a black mirror, water, even the surface of ice. It is a very ancient technique and one traditionally enacted on Samhain (Halloween). The keys to effective scrying are being as relaxed as possible, minimizing possible distractions, softening your gaze and allowing. The enemy of effective scrying is distraction, both from inside and out. Turn off the phone, electric lights anywhere you can see them, any music, and if you are scrying outdoors, take the time to setting into the environment and listen to all the noises so that your mind will not need to break your focus later. It is also vitally important to settle the mind as much as you can. If you regularly meditate, you may wish to use those techniques or otherwise you can simply shut your eyes and focus on slowing your breath – this is usually very effective. If you have a specific question for the scrying medium, state it up front. Then, when you feel relaxed, turn your focus inward. Imagine pulling your energy within you and then you focus on the third eye point (the chakra point on the center of the forehead, just above the eyebrows) and imagine opening it. Then gaze in a soft unfocused way at your scrying surface and simply allow images to form and observe what present itself to you. Do not engage your rational mind – this is about receiving and not thinking! Should you pull the Scrying card, I suggest you try it for starters. It also indicates that you may wish to develop your intuition further and not rely solely on the logical part of your mind for all the answers. It takes a balance of logic and imagination and intuition for true wisdom. Morning! In our household, much time and energy last night and this morning has been sucked up by this little bundle of cuteness. 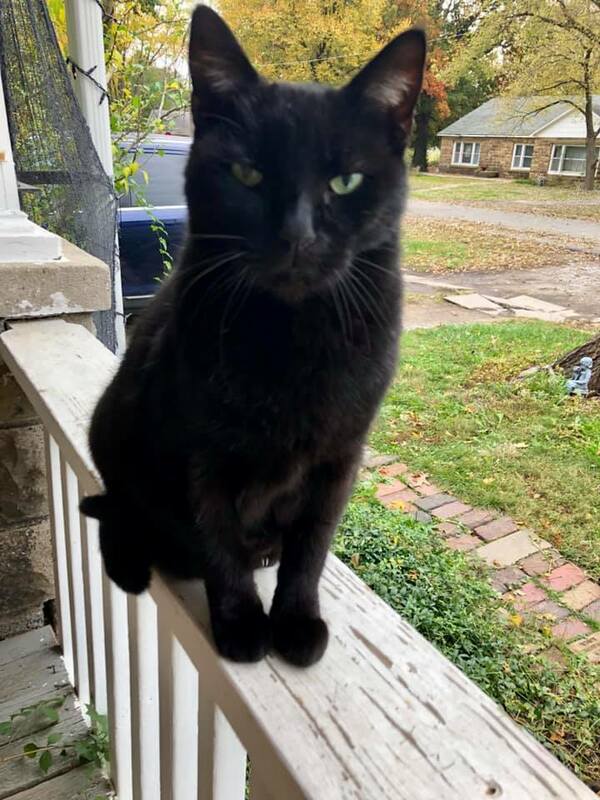 A neighbor was trying to keep this lost one out of freshly poured concrete, and for some reason everyone thinks we are the neighborhood caretakers of all the lost critters. Of course, we did keep it and are trying to find wee one’s home. Yes, we are suckers. Now on to the cards. 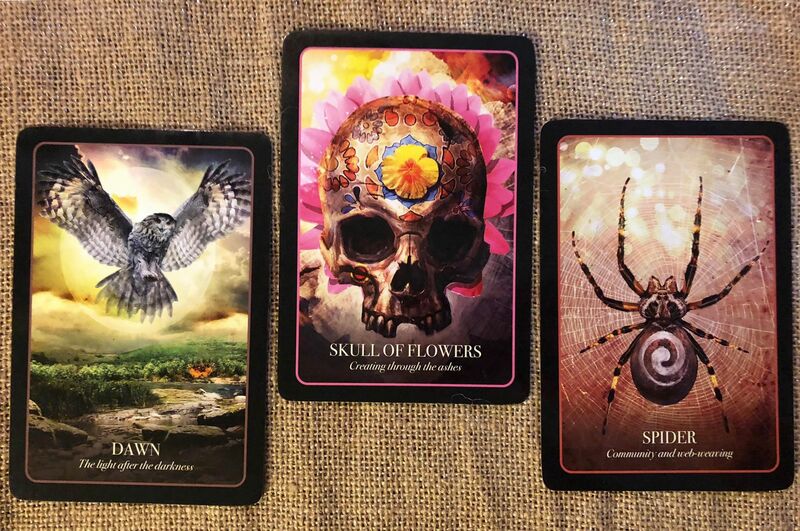 I found all of today’s spread interesting, and I think it says something about the current state of society: Dawn (the light after the darkness), Skull of Flowers (creating through the ashes), and Spider (Community and web-weaving). Before flowers are born, they are sweet buds on a plant that came from a smaller form like a seed or a bulb. The seed needs prepared, nourishing soil to grow to its potential. Some plants and trees only seed after fire or a period of extreme adversity like drought or flood. Sometimes we wish for a life different from the one that we have and that can mean radical change. Sometimes to have that new life, everything falls apart to make it so – and that can be uncomfortable. We may lose our relationships or they may change. We might lose a job, have to move house or become ill – all big events that lead to a reassessment of the “how” of our lives. 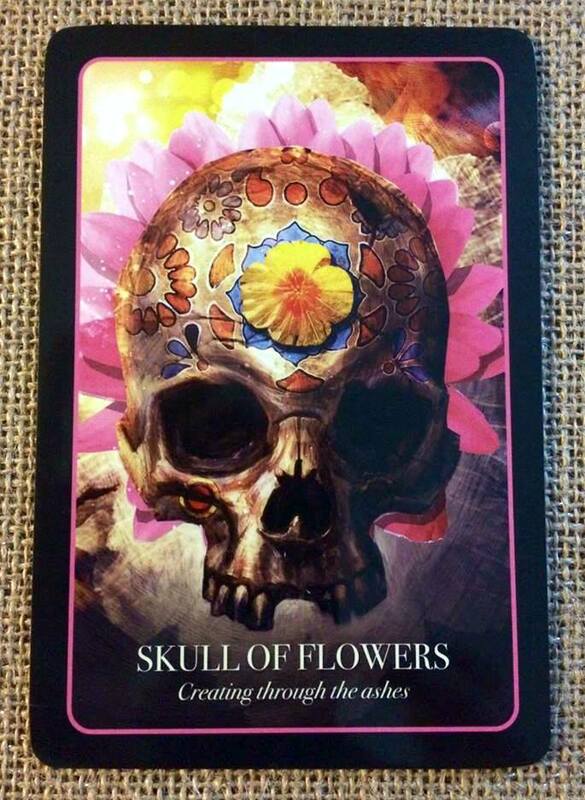 The Skull of Flowers illustrates that there is a sureness and yet a rawness to creating again, to starting afresh. Sometimes the universe gives us a blank slate to work from, so we can build what we really want, rather than just settling for less. The Skull of Flowers celebrates not just a kind of phoenix energy but also an energy of success and full bloom through adversity. 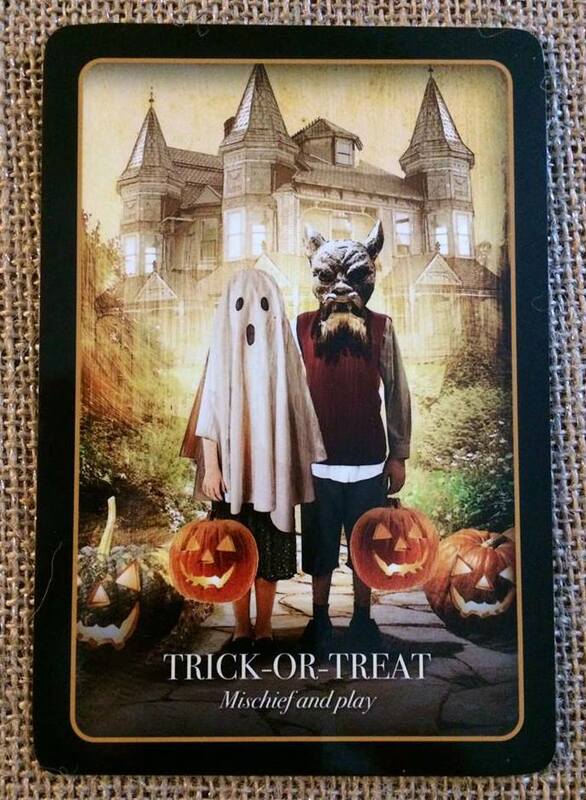 This card is revisiting rather soon, but perhaps there’s a reason for it. Take time to act in ways that benefit you in the long run rather than a knee-jerk reaction. 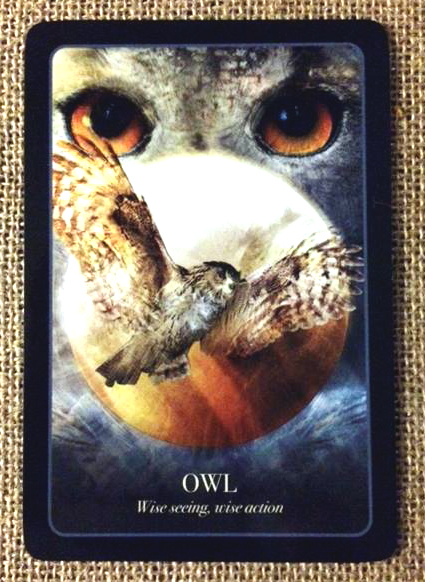 Owls have for thousands of years been part of folklore and have been considered a special or sacred animal. With their huge forward-facing eyes and otherworldly appearance, they have been seen as both wise and as harbingers of the supernatural. There are many hundreds of species of owls and almost all are nocturnal and carnivorous. Interestingly, they all have specially designed feathers that enable them to fly silently at night, giving them an incredible hunting advantage, sort of like having a stealth mode! Many deities were said to be able to change into owls and perhaps the most famous was the Green Goddess Athena, who was famous for her strategy and intelligence. To this very day, the capital of Greece, Athens, has Athena’s owl as its symbol. 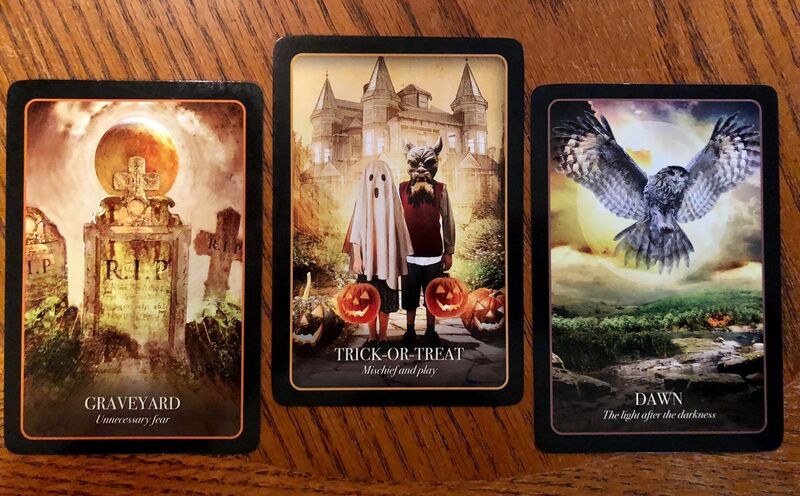 Should the hooting owl come looking for you this Halloween, it indicates the need for wise council or further information before you make a decision. Considered action is warranted. Think before you act emotionally and ensure that you think strategically, not impulsively.